Governor Shepherd - The Association of the Oldest Inhabitants of D.C.
Shepherd served as the Territorial Governor of the District of Columbia from 1873 to 1874. Today, many of the infrastructure improvements we take for granted are the result of his efforts to improve the city through public works improvements. 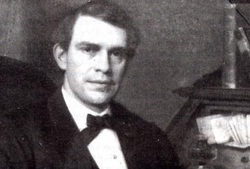 Alexander R. Shepherd remains a man of contradiction 114 years after his death. Shepherd’s public legacy is one of great personal achievement as the builder of modern Washington, but his obsession with the physical infrastructure relegated social justice to second place. Born in Washington in 1835, the descendant of Charles County, Md. slave-holding tobacco planters, Shepherd left school early to support his family after his father’s premature death. He demonstrated business acumen when he joined as an apprentice, became a partner, and was soon owner of the J.W. Thompson plumbing establishment, Washington’s largest. After volunteer service in a Washington militia unit at the outbreak of the Civil War, Shepherd found a second calling in politics and was elected President of the Washington Common Council at the start of his second term in 1862. Shepherd realized the impossibility of creating a modern city in Washington because of its fragmented governing system of three separate jurisdictions and because it had scant financial support from Congress for public works. 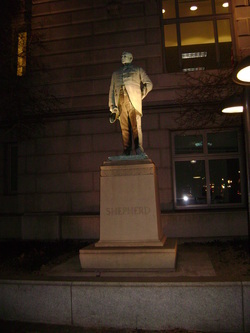 Following creation of the Territory of the District of Columbia in 1871, Shepherd took control of the Board of Public Works, through which he gained virtually sole control over public works projects and financing. After a hectic two-year campaign fighting nature and political opponents, Shepherd put the “flesh” on the “bones” of the Pierre L’Enfant plan for the District by level-grading and paving the streets, covering the fetid Washington Canal (now Constitution Avenue), planting 64,000 trees, and providing street lighting. In the process Shepherd’s own business affairs deteriorated. The 1873 Panic followed the collapse of the Jay Cooke financial empire and resulted in Shepherd’s personal bankruptcy in 1876. But before then, Shepherd served a tumultuous nine months as Governor of the Territory that included a second congressional investigation that turned up mismanagement, massive overspending, and cronyism that damaged his credibility even though no evidence of personal corruption was established. In the wake of the uproar, Congress cancelled the territorial government and so began 100 years of direct rule over the District. Determined to recoup his lost fortune and return to Washington in triumph, Shepherd organized an ambitious silver-mining operation in Mexico with large-scale financing from New York businessmen. He moved his family to remote Batopilas, Chihuahua State in 1880. Despite early promise, Shepherd’s hopes for the mining venture never met expectations. A combination of exaggerated ore estimates; over-investment in aqueducts, tunnels, and equipment; and the United States’ decision to remain on the gold standard doomed the project. Years later, Shepherd’s estate was still unable to make good on promissory notes so confidently given at the time of his 1876 bankruptcy. Once one of Washington’s richest men, his fortune evaporated while in public office, and the lure of Mexican silver wealth proved unattainable. Paradoxically, Shepherd was a man of great accomplishment and great failure, far-sighted yet obtuse, and ultimately proven wrong in his stubborn conviction that he could overcome all obstacles. 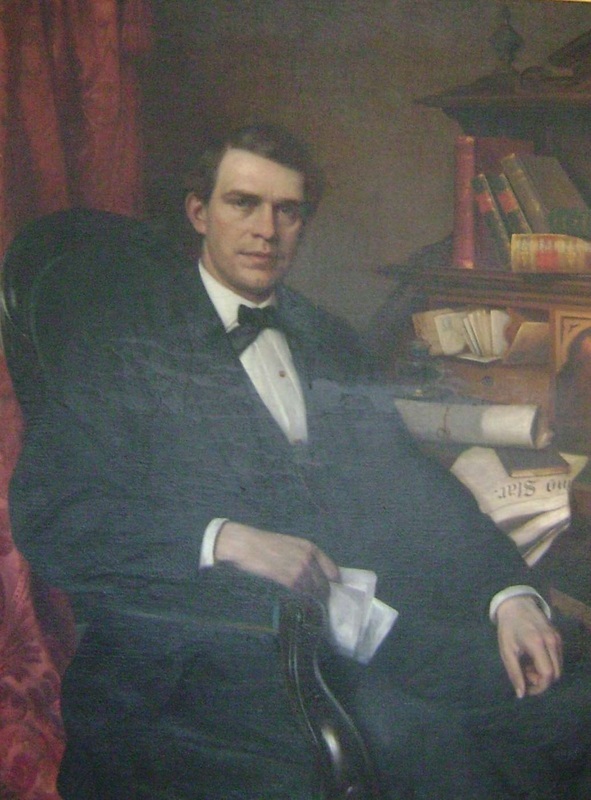 Read John Richardson's "Tale of Two Cemeteries" which appeared in the June 2014 issue of American Cemetery which explores the Shepherd family's choices of cemeteries in Washington, D.C.
A portrait of Governor Alexander Robey Shepherd which hangs in the office D.C. Council Member Jim Graham. 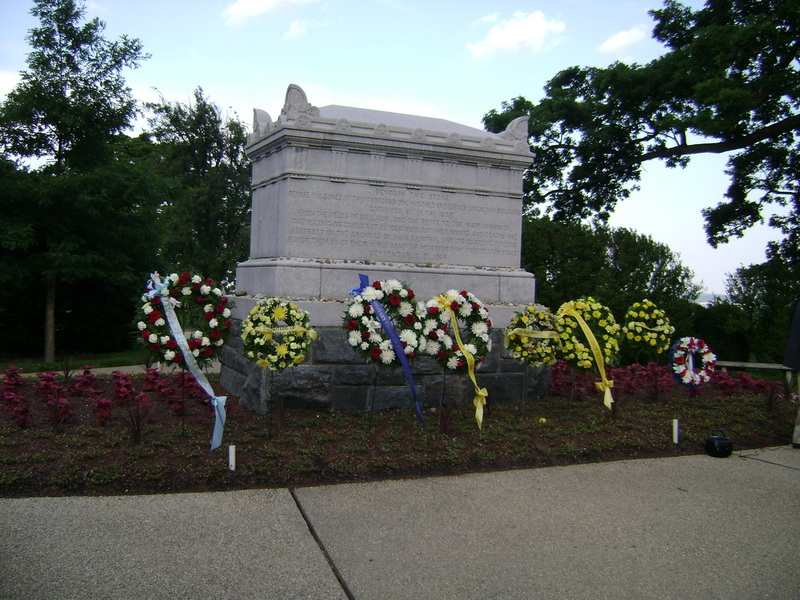 Each year, the Sons of the Union Veterans of the Civil War celebrate Decoration Day at the old amphitheater at Arlington National Cemetery adjacent to the Tomb of the Civil War Union Unknown Soldiers. On May 30, 2013, AOI President Bill Brown was asked to provide remarks on the occasion. He spoke of Gov. Alexander Shepherd's service during the Civil War with historical research provided by AOI Historian Nelson Rimensnyder. 2013 Decoration Day at Arlington Cemetery's Tomb of the Civil War Unknowns. 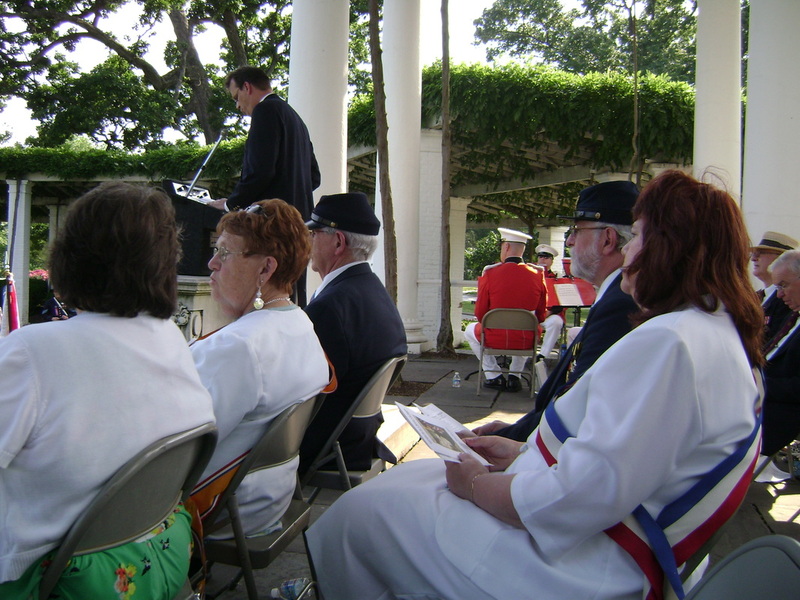 Sons of Union Veterans of the Civil War speaker Geoffrey Burden with the Marine Band Brass Quintet in the background. After an exile of nearly a quarter century, the statue of the District's native son, Union Army Veteran, Vice-president of Public Works and Territorial Governor Alexander Robey Shepherd finally returns to his home in front of the District Building. 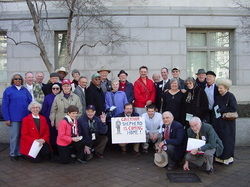 On January 1, 2005, 35 AOI members assembled in front of the John A. Wilson (District) Building to seek the return of the statue to a place of prominence. 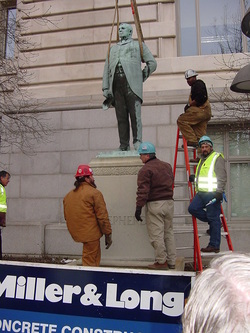 On Saturday, January 29, 2005 -- three days before Shepherd's 140th birthday -- the Dunbar scupture of Governor Shepherd was removed from the District's Department of Transportation facility on Shepherd Parkway, SW and transported back to a place of prominence in downtown D.C. With the support of City Council-members Jim Graham and Jack Evans, Council Secretary Phyllis Jones, DDOT Director Dan Tangherlini and through the generosity of the Gilford Corporation, Miller & Long Concrete Construction, Hutchison International (United Rigging) and the Associated Builders & Contractors, the Association of the Oldest Inhabitants of D.C. has finally realized its long-fought effort to have the Governor Shepherd statue returned to the area from which it was removed in 1979 during the reconstruction of Pennsylvania Avenue and Freedom Plaza. Today, rather than staring out over the city's impound lot, the Governor casts his gaze across the avenue near the very location where the statue was originally dedicated on May 3, 1909. AOI Historian Nelson Rimensnyder has never missed an opportunity for over a decade to champion the statue's return. Our hats are off to Nelson and everyone who helped make this happen. Just in time for the January 20, 2009 inauguration of President Barack Obama, the M.C. Dean Company stepped in and installed lighting to properly illuminate the statue. 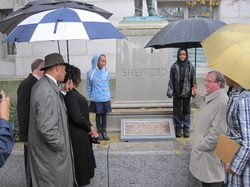 On November 16, 2010, students from the Shepherd Elementary School, their parents, principal, members of the D.C. City Council and AOI members unveiled the commemorative plaque that AOI commissioned to interpret Shepherd's life and accomplishments. The only thing that remained to 'finalize' the Governor Shepherd Statue's return to downtown D.C. was its cleaning and conservation. In April 2012, the D.C. Commission on the Arts and Humanities provided the funds to properly clean, restore and conserve the sculpture designed by USG Dunbar more than a century earlier. The conservation was performed by Artex Fine Arts Services of Landover, Maryland. The AOI of DC plans to use the designated donations that it receives for "The Shepherd Statue" to fund future maintenance of the work. 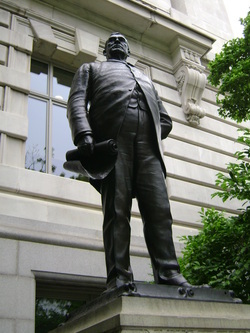 When we learned in 2012 that the D.C. Commission on the Arts and Humanities had contracted with ARTEX Fire Art Services to clean, repair and conserve the statue of Governor Shepherd, we wanted to ensure a maintenance schedule was established to avoid long periods of neglect which would ultimately result in more costly repairs. AOI member Edith Johnson stepped forward and has made a substantial donation that will ensure the statue is inspected, cleaned and touched-up every 3 years, commencing in 2015. Edith’s generous gift, together with the proceeds of other directed donations by AOI members, will safeguard the USG Dunbar statue beyond 2030. This gift from Edith Johnson is the most substantial donation to the AOI since a bequest of Theodore Noyes, Editor-in-Chief of the Evening Star, upon his death in 1946. “Thank you, Edith!” for ensuring the statue of the District’s last Territorial Governor will be preserved for years to come. AOI Secretary John Richardson has been working on his biography of Shepherd for years. You can read about his research journey and see a brief video account of Shepherd's accomplishments on WETA-TV "Boundary Stones" history blog. And here is The Washington Post's​ John Kelly's account of John Richardson's 30-year effort to document Shepherd's life.